The 180 Medical Kids Club was created to ease the fears of families like yours that have been told your child needs to catheterize. 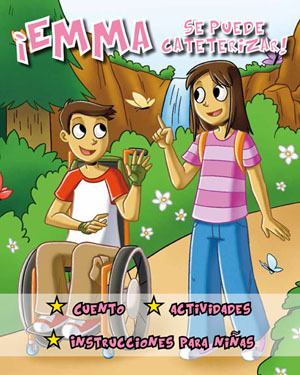 Now our colorful, informative booklets come in Spanish! We’ll help you adjust to this new way of life with one-of-a-kind educational materials and fun activities for your child. These will teach you and your child how to use catheters correctly to help reduce the occurrence of infections. Ethan is just like any other 10 year old boy. He likes playing games with friends, playing basketball, and going to school. He gets around a little easier with his wheelchair and likes to race and learn new tricks. Emma is Ethan’s twin sister. She likes to play with dolls, go to the zoo, and swim. Both Ethan and Emma have something called Spina Bifida. According to the Spina Bifida Association, this condition occurs when the spine of a baby fails to close during the first months of pregnancy. Spina Bifida is the most common permanently disabling birth defect in the United States. It affects everyone differently. In this book, Ethan and Emma both have to use urinary catheters because of their condition, known as neurogenic bladder. book have detailed instructions on how to use a closed system catheter, hydrophilic catheter, straight catheter, and how to catheterize through a stoma with colorful illustrations, showing girls and boys how to self-cath. The booklets also include a coloring page, and a cathing diary where children or parents can log the date, time, input, output, and leakage. 180 Medical is committed to educating, and supporting our patients and their families.